The master cylinder must be kept properly filled to insure adequate reserve and prevent air from entering the hydraulic system. It must not be overfilled, however, as expansion due to heat absorbed at brakes and from engine would cause fluid to overflow through the vent in filler cap nut. The overflow fluid would accumulate road dust and grit which increases the possibility of foreign material getting into the hydraulic system. Dirt accumulated over the vent holes would affect operation if the master cylinder. Thoroughly clean adjacent area then remove master cylinder filler cap nut and gasket. Fill reservoir as required to bring fluid level to 1/2″ to 1″ below top of filler opening. Master Cylinder Filler J 713 with Adapter J 713-2 will automatically fill reservoir to correct level. See figure 8-5. Use only new G.M. or Delco Super No. 11 hydraulic fluid, or No. 12 if No. 11 is not available. CAUTION: Do not use shock absorber fluid or any other fluid which contains mineral oil. Do not use a container which has been used for mineral oil. Even a trace of mineral oil will cause swelling and distortion of rubber parts in the 1952 Buick hydraulic brake system. Check for clear vent holes in filler cap nut, then install cap nut and gasket. 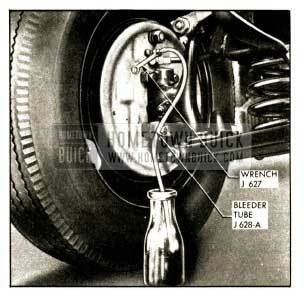 A bleeding operation is necessary to remove air whenever it is introduced into the 1952 Buick hydraulic brake system. Since air is compressible and hydraulic fluid is not, the pressure of air in the system is indicated by a springy, spongy feeling on the brake pedal accompanied by poor braking action. Air will be introduced into the hydraulic system if the 1952 Buick brake pedal is operated when the fluid is too low in master cylinder reservoir. Air will also enter the system whenever any part of hydraulic system is disconnected. It will be necessary to bleed the hydraulic system at all four wheel cylinders if air has been introduced through low fluid level or by disconnecting brake pipe at master cylinder. If 1952 Buick brake pipe is disconnected at any wheel cylinder, then that wheel cylinder only need be bled. If pipes are disconnected at any fitting located between master cylinder and wheel cylinders, then all wheel cylinders served by the disconnected pipe must be bled. See figure 8-3. It is advisable to bleed one wheel cylinder at a time to avoid getting fluid level in reservoir dangerously low. The correct sequence of bleeding is left front, right front, left rear, right rear. This sequence expels air from the lines and wheel cylinders nearest to the master cylinder first, and eliminates the possibility that air in a line close to the master cylinder may enter a line farther away after it has been bled. CAUTION: Do not perform bleeding operation while any brake drum is removed. Thoroughly clean master cylinder filler cap nut and surrounding area, then remove cap nut. Fill Master Cylinder Filler J 713 with specified brake fluid (par. 8-8) and use Adapter J 713-2 to support the filler in place on master cylinder. See figure 8-5. Leave Filler J 713 in place during all bleeding operations as it automatically maintains the proper level in reservoir as fluid is pumped out of master cylinder. Remove screw and attach Brake Bleeder Tube J 628-A to wheel cylinder bleeder valve. Place lower end of bleeder tube in a clean glass jar. Unscrew bleeder valve 3/4 of a turn, using Bleeder Wrench J 627. See figure 8-6. Depress 1952 Buick brake pedal a full stroke, then allow pedal to return slowly to released position. Allowing pedal to return quickly may draw air into system. Continue operating pedal in this manner until fluid flows from bleeder tube into glass jar in a solid stream that is free of air bubbles, then close the bleeder valve securely. Remove bleeder tube and install screw in valve. After bleeding each wheel cylinder check filler jar to make sure it contains enough fluid for the next bleeding operation. Approximately one-half pint of fluid is required to bleed each wheel cylinder. Allowing reservoir to be emptied will cause air to be drawn into hydraulic system. When bleeding operation is completed at all wheel cylinders where needed, make sure that fluid level is 1/2″ to 1″ below top of master cylinder filler opening then install filler cap nut and gasket. Discard the brake fluid deposited in glass jar during bleeding operation. It is poor economy to attempt to clean fluid that has once been used. 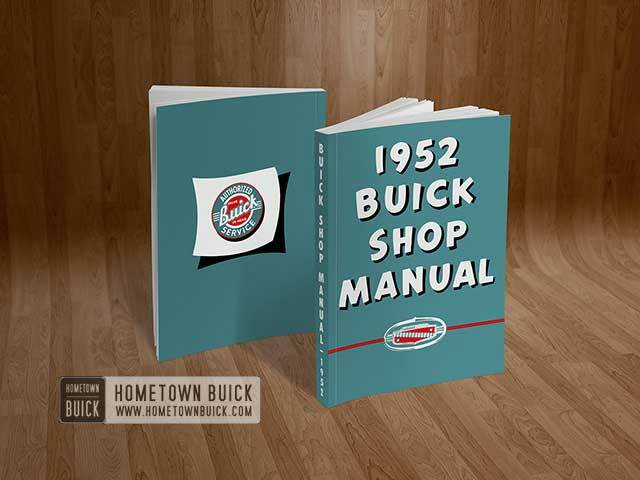 Test 1952 Buick brakes (par. 8-5). 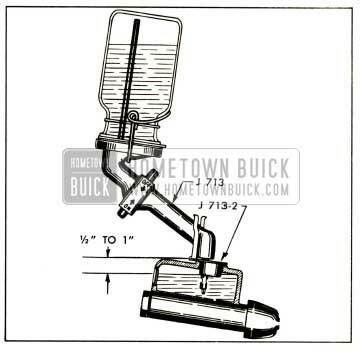 IMPORTANT: When using a pressure tank, air bubbles may form in the tank and enter the 1952 Buick brake hydraulic system. To avoid this observe the following points when handling a pressure tank: (1) Do not shake or agitate the pressure tank after air pressure has been added or is being added. (2) Allow pressure tank to stand in one position as much as possible, and bring air hose over to tank when adding head of air. (3) Make certain the valves on the pressure tank lines are not defective allowing air to be sucked in when fluid passes through the lines. (4) Pressure tank should be kept at least 1/3 full of fluid to avoid air bubbles forming. (5) If pressure tank is full of air bubbles, release air pressure and those bubbles will increase in size and be forced to top of fluid, and escape. Make sure that pressure tank is at least 1/3 full of specified brake fluid (par. 8-8), that hose and master cylinder reservoir are filled with fluid, then attach hose to master cylinder filler opening. Remove screw and attach Brake Bleeder Tube J-628-A to wheel cylinder bleeder valve. Place lower end of bleeder tube in a clean glass jar. Unscrew bleeder valve 3/4 of a turn, using Bleeder Wrench J 627. See figure 8-6. Open pressure tank hose valve to apply fluid to master cylinder under pressure that does not exceed 35 pounds. Too much pressure may blow out the expansion plug in master- cylinder. It is not necessary to pump the brake pedal when using pressure tank. When fluid flows from bleeder tube into glass jar in a solid stream that is free of air bubbles, that particular cylinder and line are bled; tighten bleeder valve securely, remove bleeder tube and install screw in bleeder valve. It is recommended that the entire hydraulic system be thoroughly flushed and cleaned every 15,000 miles, or whenever new parts are installed in the hydraulic system, or new shoes or linings are installed. Flushing is also recommended if there is any doubt as to the grade of fluid in the system or if fluid has been used which contains the slightest trace of mineral oil. M. Declene Flushing Fluid, Group 4.683, is recommended as the most satisfactory flushing and cleaning fluid. It is red in color to distinguish it from brake fluid and thereby indicate when it is coming through the hydraulic system clear of dirt and old fluid. If Declene is not available, specified brake fluid (par. 8-8) or a good grade of alcohol may be used for flushing. Gasoline, kerosene, or any other fluid containing even a trace of mineral oil must not be used as such fluids will cause serious damage to rubber parts. Flushing is performed at each wheel cylinder in turn, and in the same manner as the bleeding operation (par. 8-9) except that bleeder valve is opened 1 1/2 turns and the cleaning fluid is forced through the pipes and wheel cylinder until it emerges clear in color. Approximately one quart of cleaning fluid is required to flush the hydraulic system thoroughly. When flushing is completed at all wheel cylinders, substitute specified brake fluid at master cylinder and repeat the operation at each wheel cylinder in turn until clear brake fluid emerges in a solid stream free of air bubbles. Make sure that all cleaning fluid is forced out of hydraulic system by the fresh brake fluid as neither Declene nor alcohol is a satisfactory brake fluid. Also, make certain that master cylinder reservoir is filled to proper level when job is completed. 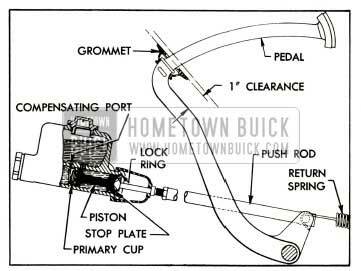 The 1952 Buick brake pedal adjustment is provided to insure proper position of the master cylinder piston and primary cup when brakes are released, and adequate pedal travel when brakes are applied. Pedal must be stopped in “off” position by contact of push rod with stop plate in master cylinder, in order that the piston primary cup will be clear of the compensating port. See figure 8-7. Check 1952 Buick brake pedal for free action; correct any bind on shaft or floor mat. Replace pedal return spring if too weak. Depress brake pedal, then let it return to “off” position-a slight metallic click will be heard if push rod strikes stop plate. NOTE: If pedal strikes toeboard, check for displaced lock ring and stop plate. With push rod against stop plate, pedal grommet should lightly contact toeboard and clearance between pedal and toeboard should be approximately 1″. If push rod does not contact the stop plate, or pedal-to-toeboard clearance is excessive, loosen the lock nut and turn the inner push rod (in master cylinder) as required. Hold the push rod while tightening lock nut. 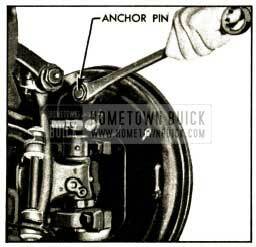 The minor 1952 Buick brake adjustment is intended for use where braking action is equal and generally satisfactory except that brake pedal goes too close to toeboard due to wear of brake linings. If braking action is unequal or otherwise unsatisfactory, the major brake adjustment should be used (par. 8-15). Do not adjust when 1952 Buick brakes are warm. 1952 Buick brake drums should be approximately room temperature. Jack up all four wheels in a safe manner. Check fluid level in master cylinder reservoir and add fluid if necessary (par. 8-8). Check brake pedal for free action, proper return to stop, and proper clearance at toeboard (par. 8-11). Fully release parking brake lever. Pull on both ends of rear brake cable a number of times to make sure that cables operate rear brake shoes freely and do not bind in conduits. Check for free movement of cable in brake cable sheave and check brake cable spring for tension. If cable action is not free, the cable and sheave should be lubricated (par. 8-14). Replace a weak or broken cable spring. Check all anchor pin nuts with 16″ Wrench J 854 to make certain nuts are tight. See figure 8-9. If an anchor pin nut is found loose, reset anchor pin as instructed in paragraph 8-15, step 19 otherwise do not disturb anchor pins. Remove adjusting hole covers from 1952 Buick brake backing plates. Using suitable tool to turn brake adjusting screw, expand brake shoes at each wheel until the wheel can just be turned by hand. Moving outer end of tool upward toward center of wheel expands the shoes. See figure 8-8. The drag should be equal at all wheels. With shoes expanded in both rear drums and parking brake lever fully released, check parking brake cables for proper tension. While holding 1952 Buick brake lever cable end to prevent twisting, tighten cable adjusting nut at cable sheave to remove any slack from rear brake cable. Back off nut if cable is under tension. NOTE: Make sure that cable sheave is horizontal, otherwise it may slap against torque tube on bumpy roads. Back off 1952 Buick brake adjusting screw at each wheel 15 notches. If shoes still drag lightly on drum, back off adjusting screw one or two additional notches, NOTE: Brakes should be free of drag when screw has been backed off approximately 6 notches. Heavy drag at this point indicates improper anchor pin setting or tight parking brake cable s.
Install adjusting hole covers in all brake backing plates when adjustment is completed. Remove jacks and road test car for service and parking brake performance (par. 8-5 and 8-6). 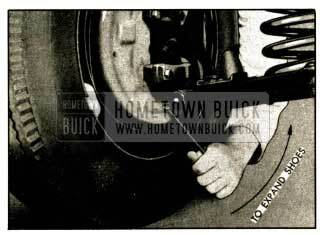 Adjustment of the 1952 Buick parking brake is included in the minor brake adjustment described in paragraph 8-12. It is advisable to use the complete minor brake adjustment if the position of brake pedal, when applied, indicates that some brake lining wear has taken place since brakes were last adjusted. In this case, adjustment of parking brakes only will result in the front brake shoes having more clearance than the rear shoes. If 1952 Buick brake linings have not worn appreciably, it is permissible to adjust parking brakes separately to take up slack in brake cables. Jack up rear wheels only and adjust parking brakes by performing steps 4 through 9 of minor brake adjustment (par. 8-12). Do not attempt to adjust parking brakes by simply tightening adjusting nut at brake cable sheave as this practice may result in taking up necessary clearance of brake shoes and cause them to drag. Lubrication of parking cables is not included in Lubricare Instructions (par. 1-1) since these cables are usually lubricated during a major brake adjustment. Vehicles habitually operated under conditions where mud and water are frequently encountered may require more frequent lubrication to insure free action and avoid excessive wear of cables. Disconnect brake lever cable at cable sheave (equalizer). See figure 8-2. Disconnect rear brake cable conduits from rear brake backing plates and from clips on strut rods. Slide each conduit away from backing plate and coat the cable sparingly with Bendix or Delco Brake Lubricant, or Lubriplate. Also lubricate cable where it passes through the sheave and make sure cable slides freely in sheave. Slide conduit to within 2″ of normal position, then clean surplus lubricant from cable at backing plate to avoid forcing it into brake assembly where it will get on brake linings. Connect conduits to clips on strut rods and to backing plates. Although the brake lever cable rarely needs lubrication it may be lubricated at this time by disconnecting cable at brake lever and removing exposed portion from grommets under torque tube. Heavily coat exposed section under torque tube with graphite lubricant, then pull cable out of conduit at upper end. This will cause lower section of cable to deposit lubricant in rear end of conduit. Coat upper end of cable with graphite lubricant, then pull upper end of cable back into conduit and connect to brake lever. Connect brake lever cable at cable sheave and adjust parking brakes (par. 8-13). The major brake adjustment is intended for use when new shoes or linings are installed. It is also to be used when brake action is unequal, severe, or otherwise unsatisfactory. Throughout the adjustment procedure additional operations are specified where inspection indicates their need. Each additional operation is identified by an asterisk (*) preceding the reference to paragraph number covering the operation. The major brake adjustment combined with required additional operations constitute a general overhaul of the entire brake mechanism. Jack up car in a safe manner and remove all wheels. Check brake pedal for free action, proper return to stop, and proper clearance at toeboard (par 8-11). Pump brake pedal a number of times with quick release. If pedal develops a very solid feel and reduced travel, and brakes drag heavily when drums are turned it indicates that the compensating port in master cylinder is blocked by a distorted piston primary cup. If brake pedal goes slowly down when steady pressure is applied, and no leaks are found in inspection described later, it indicates a distorted primary cup or scored master cylinder barrel. Either condition requires overhaul of master cylinder (*par. 8-19). Inspect all brake pipe and hose connections for evidence of fluid leakage. See figure 8-3. Tighten any leaking connection, apply heavy pressure to brake pedal to build pressure in hydraulic system, and recheck connections. Remove rear brake drums, and front hub and drum assemblies. NOTE: Brake pedal must not be operated while drums are removed. Clean all dirt out of brake drums, using care to avoid getting dirt into front wheel bearings. Inspect drums and replace or recondition if required (* par. 8-17). Inspect front wheel bearings and oil seal packings. Replace faulty bearings or packings (*par. 6-14). Blow all dirt from brake assemblies, then inspect brake linings for wear, oil soaking, loose rivets, and imbedded foreign particles. If linings are oil soaked, replacement is required (*par. 8-16). If linings are worn down to rivets, or the total thickness of lining and shoe rim at thinnest point is less than .180″ (measured with ball micrometer), replacement is required (*par. 8-16). If total thickness of lining and shoe rim is .200″ at thinnest point, car owner should be warned that lining replacement will be required in 3000-5000 miles. If linings are otherwise serviceable, tighten or replace loose rivets and thoroughly clean all steel or other imbedded particles from surfaces and rivet counterbores of linings. When a rivet head is touching the drum and total thickness of lining and rim is more than .200″, it is permissible to remove the rivet to prevent scoring of drum except when rivet is at end of lining. Not more than one rivet may be removed from each row of rivets. If brake linings at any wheel show a spotty wear pattern indicating uneven contact with brake drum it is advisable to true up the linings with a light grinding cut, if suitable grinding equipment is available. If brake action was unequal, severe or hard, indicating that brake shoes were not centralized in drums, the grinder may also be used to correct this condition. The grinding equipment should locate and swing off the wheel spindle or axle shaft so that shoes will be ground concentric with drums. The instructions of equipment manufacturer must be carefully followed. Carefully pull lower edges of wheel cylinder boots away from cylinders and note whether interior is wet with brake fluid. Fluid at this point indicates leakage past the piston cup, requiring overhaul of wheel cylinder (*par. 8-18). Inspect rear brake backing plates for oil leaks past wheel bearing oil seals. Correct any oil leaks by installation of new seals (*par. 5-9). Check all backing plate attaching bolts to make sure they are tight. Check anchor pin nuts for tightness, using Wrench J 854 (fig. 8-9). If an anchor pin nut is found loose, anchor pin must be reset as described later (step 19). Lubricate parking brake cables (par. 8-14). Cables will be adjusted later. If brake shoes were not removed for additional work, pry shoes away from backing plates and clean all rust and dirt from contact surfaces on shoes and plates, using fine emery cloth. Lubricate contact surfaces with a thin coating of Bendix or Delco Brake Lubricant, or Lubriplate. On rear brakes, sparingly apply the same lubricant to parking brake strut and backing plate boss under the brake cable. Lubricate front wheel bearings, install hub and drum assemblies and adjust wheel bearings (par. 6-14). Install rear brake drums. Remove adjusting hole covers from all backing plates. Using suitable tool (fig. 8-8) turn brake adjusting screw to expand brake shoes until drum can just be turned with a long bar, giving a drag equivalent to a two-hand drag with wheel installed. Use Wrench J 854 (fig. 8-9) to loosen anchor pin nut just enough so that pin can shift in slotted hole in backing plate. If nut is loosened too much, the anchor pin will tilt due to pull of brake shoe springs. Rap backing plate with hammer adjacent to anchor pin to cause pin to shift into central position between ends of brake shoes. Check brake drag with bar and tighten adjusting screw if drag has decreased, rap backing plate, and recheck brake drag. When anchor pin has been shifted into a central position between ends of shoes as described, tighten anchor pin nut securely. Tightening anchor pin nut should not change the brake drag previously obtained. If it does, repeat the procedure without loosening anchor pin nut quite as much, and tap on anchor pin nut if necessary to shift anchor pin. Install all wheels, turn adjusting screws to provide an equal two-hand drag, then adjust parking brake cables and adjust shoes for proper clearance as described in paragraph 8-12, steps 7, 8, 9. If any hydraulic connections were disturbed or if master cylinder reservoir was pumped dry, bleed hydraulic system at affected wheel cylinders (*par. 8-9). If new parts were installed in hydraulic system, or brake fluid has been in service 15,000 miles, flushing of hydraulic system is recommended (*par. 8-10). If car is equipped with a parking brake release warning signal, check its adjustment as described in paragraph 10-67.